The Washington Examiner, using the provocative headline “Fishwrap: Just 2% of younger Americans trust media to ‘do the right thing,’” reports media limps in dead last among institutions younger voters trust. The Examiner cites a new Harvard University survey. For motorists on the way to Tucson from Phoenix, little interrupts the desert’s color scheme. Then, a flicker of white, red and blue draw eyes to the west, where a cluster of tail fins pokes over the horizon. As tires chew asphalt with a hypnotic thrum, the sleek metallic bodies connected to those fins emerge. Passenger jets, too many to count at 75 mph, sit wing to wing. The 747s are easy to pick out, thanks to their immense size and bulbous noses. The other jets are noted only for their sheer number, as dozens comprise a tableau one would expect at an airport, not in a solitary patch of land bounded by desert on one side and cotton fields on the other. The next exit offers a partial explanation: Pinal Airpark Road. Adventurous travelers who just a few years ago followed the two-lane road past the sand and gravel pit would have encountered an armed guard at the airpark’s gate. The alarmed barks of guard dogs emphasized the point — visitors were not welcome. Today, however, the small guard shack is empty. Concrete pads are all that remain of the kennels, where guard dogs awaited orders. 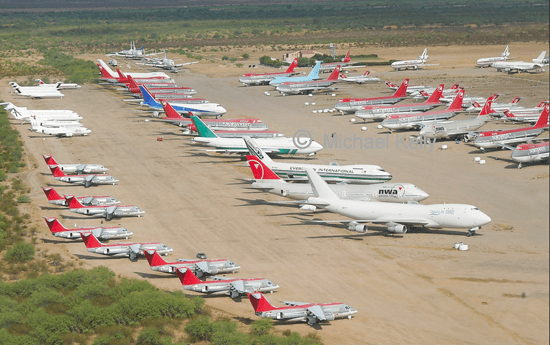 Stand outside Pinal Airpark’s chain-link fence for a good view of its 100-plus airliners in varying states of decay. From here it appears little more than a boneyard, a tattered tableau of jetliner history. But something is out of place, like those gleaming white 747s. It begs a closer look. Jim Petty agrees, and he has the keys to this once-mysterious airline kingdom. **Petty opens the door to Pinal Airpark’s headquarters — a double-wide trailer that didn’t exist a year ago — and offers an enthusiastic handshake. The few who know where to find him are fortunate to find him within, as he splits his time among the county’s two airfields and his Florence office. Petty is happy to offer tours of the public airfield, inviting visitors inside his county-supplied SUV for a lap around the facility (and halting at a curiously placed stop sign until you realize it’s at the end of the runway, and aircraft have the right of way). Petty, the airport economic development director, is liaison between Pinal County and the airpark’s tenants, the largest of which, Marana Aerospace Solutions, is minding most of the jets parked here. Much goes on here other than maintenance and salvage. To the north, Silverbell Army Heliport, run by the Army National Guard, trains hundreds of military pilots each year. To the west is the landing zone for paratroopers training at the U.S. Special Operations Command’s Parachute Training and Testing Facility. On busier days, jump planes take off every 20 minutes or less. That’s somewhat true, for some aircraft. A jet with a faded TWA logo on its fuselage invokes images of fliers in suits and ties, with complimentary champagne served shortly after takeoff. Other planes sit with engines removed, and most have a red “X” taped to their noses, marked for salvage. But although some aircraft have been there three decades or more, others have arrived almost directly from the factory, Petty says. Those 747s, for example. Odds are they are here because a deal fell through, or the buyer (often an aircraft-leasing company) had no immediate use for them. Marana keeps the jets in ready-to-go shape, Petty says, even rolling them a foot or two several times a day to keep tires in shape. 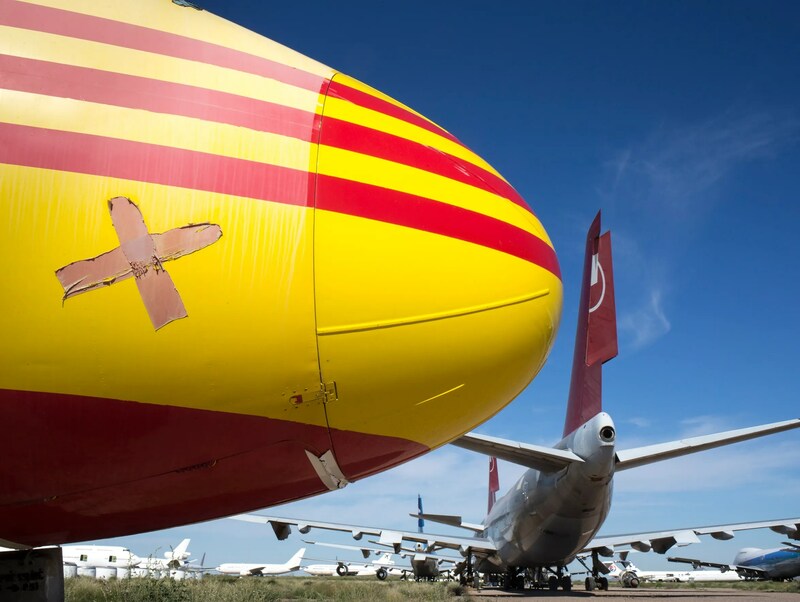 When those 747s are called into service, Petty says, they’ll be tugged into Marana’s hangar, cleaned and painted if necessary, and flown to where they’re needed. 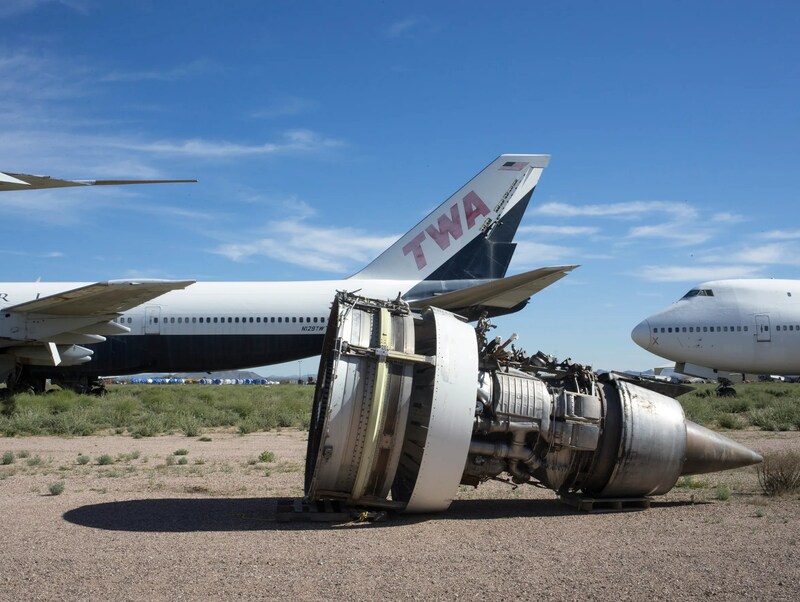 An engine, removed from a 747 at Pinal Airpark, Marana, Arizona. Petty says Marana Aerospace Solutions remains publicity shy, and Jim Martin, the company’s CEO, declined to comment on business operations. But Petty is happy to talk with anyone who catches him on duty at the airfield. He has even flagged down slow-moving travelers along the access road, inviting them in for a better look. Given Pinal Airpark’s longstanding off-limits attitude, Petty does whatever he can to open it to the public. That’s not just his personal ideals talking. The FAA lists Pinal Airpark as a general-aviation airport, which means the public must have access. For decades the airfield was not in compliance, because of leery tenants who wanted nothing to do with visitors. But at one time in its 72-year history, it was one of the most secure, and secretive, airfields in the world. The CIA would have it no other way. **Not long after the U.S. entered World War II, bulldozers began scraping a lonely patch of desert between Tucson and Picacho Peak. It was the perfect site, given the need for land and isolation. In 1943 the first soldiers arrived to train as pilots at Marana Army Air Field, but five years later there was no need for the military base. Pinal County has overseen operations ever since. Although the airpark was to be open the public, several tenants had other ideas. The CIA operated flights in and out of the airfield throughout the Vietnam War, Pettys says. The grounds were secured by patrols and motion sensors (the latter are still scattered around the field, atop 4-foot-high rusty stakes). Those entering required a security clearance. In 1975, Pinal County leased the airfield to Evergreen Maintenance, which for nearly 40 years stored, repaired or salvaged commercial aircraft, Petty says. With guards stationed at the entrance, Pinal Airpark remained visitor-unfriendly even as more aircraft arrived, adding to the curiosity factor. The attitude shifted shortly after Evergreen was sold to a venture-capital group in 2011, renaming the company Marana Aerospace Solutions. The guard post was abandoned, though a small, casually dressed security force still patrols. Petty hopes to transform the airpark into a welcoming place where gates are open to those who ask for a tour. And there is much for aircraft buffs to see, as long as they are braced more for junkyard than museum. **Imagine visiting an amusement park from your youth, arriving with memories of whirling rides, bright lights and the hint of cotton candy on a light breeze. But as you walk in you’re overwhelmed by rust and weeds. Recollections battle reality, and by the time you leave, you prefer the past to the present. Petty must manage the bitter and the sweet each time he walks through the waist-high weeds marking the final resting spot of dozens of aircraft from his youth. Most of the DC-10s, the MD-11s and the 727s sport those red Xs, the mark of death. Many have had engines and landing gears stripped. The gears, Petty says, are reclamation gold, fetching as much as $60,000 on the parts market. Others haven’t moved for 20 or 30 years, not even worth the effort to rip them apart for scrap metal. A DC-9 (yellow) sits at Pinal Airpark, Marana, Arizona. An “X” on the nose of an aircraft means it has been decommissioned and will never fly again. Memories of journeys past come to Petty, a private pilot who wonders what it would have been like to sit in the cockpit of these behemoths. The state of these aircraft also reflects the condition of Pinal Airpark itself. Once capable of housing several hundred people, most of the dorms and single-family homes to the east are unfit for occupancy. The dorms mimic the design of a 1950s motor court, many rooms facing a large, well-maintained pool frequented by the 30 or so people who stay there while training. The occupied rooms sport TV dishes; the rest are empty or used for storage. The cafe closed months ago, yet the kitchen is still used for catering when on-site meetings and functions demand it, Petty says. But time has been especially cruel to Pinal Airpark’s single runway. 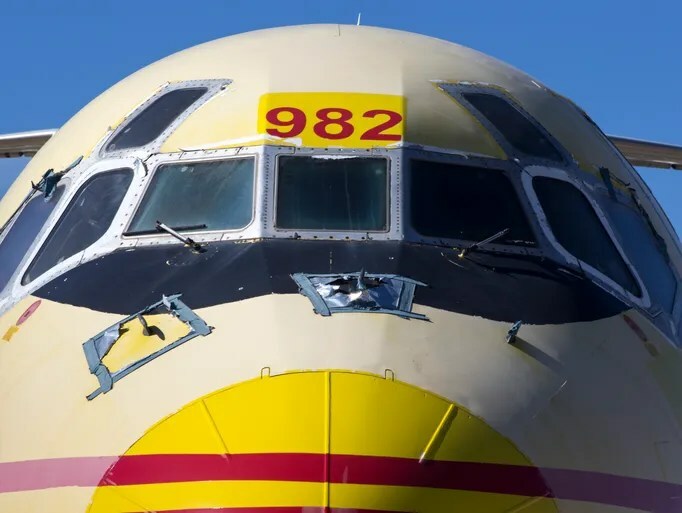 The 6,850-foot-long stretch of asphalt still catches 747s weighing as much as 383,000 pounds despite the decay that’s settled in over the years. Runways are rated 0 (crumbling asphalt) to 100 (pristine and capable of handling the world’s heaviest aircraft), Petty says. Pinal Airpark’s runway is rated 17, and pilots are informed of the condition before landing, Petty says. The taxiway is even worse. Petty has been working on a development plan that includes $2.2 million in runway repairs, which would extend its life 10 years. Replacing the runway would cost $18 million, not feasible on the airpark’s $200,000 operations budget. Petty also is seeking funds for infrastructure and housing improvements and, someday, a control tower that would allow the helicopter- and parachute-training programs to substantially expand, bringing in more money to the county. The airpark is financially self-sustaining, Petty says, thanks to leases and grants. Runway repairs and other improvements would require local, state and federal money. Petty envisions a busy airport that can safely handle increased private traffic, if not become a destination for those interested in older aircraft. And for those lured off Interstate 10 by the fuselage horizon, Petty is happy to invite them in as well. Those interested in a personal tour just need to knock on his door. If he’s in, he will be happy to comply. Just know that when he reaches the graveyard portion of the tour, marked by a series of red Xs, he may take a few moments of silence to remember the old days. What: The general-aviation airport’s 2,080 acres include training facilities for paratroopers and helicopter pilots, but the airfield is largely used by companies that store, maintain and salvage commercial aircraft. 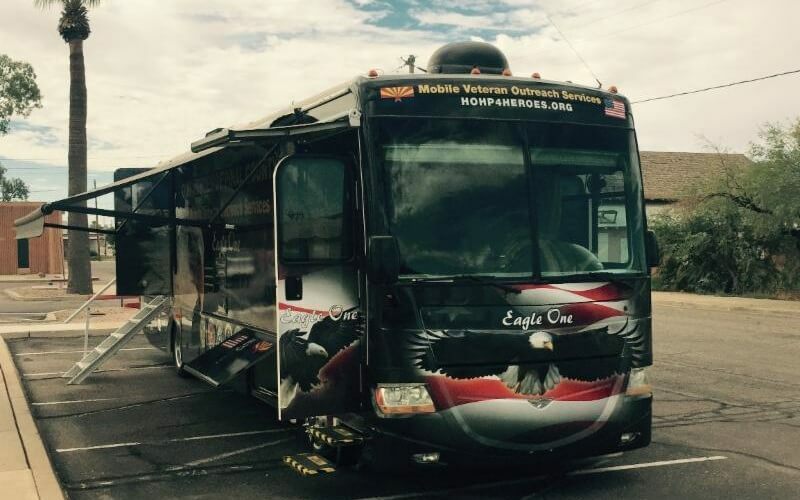 Where: 24641 E. Pinal Airpark Road, Marana. Take Interstate 10 east to Pinal Airpark Road. Turn right (west) and follow the road for 3 miles. If you have a tour appointment, turn left at the sign marking the entrance to Pinal County headquarters. Details: Free tours are by appointment only and subject to availability. Call Jim Petty, 520-866-6545. The Apache Junction High School Navy JROTC Academic Team will compete in person at the final championship event of the 2015 Navy JROTC Academic Bowl in Washington D.C., June 26-30. AJHS is one of only eight teams, nationwide, advancing to the national competition, according to a press release. The AJHS Navy JROTC Academic Team is composed of students Abbigayle Davis, Nicholas Kelley, Pita Pilas, Michael Preston, Caleb Smith and Mekaela Walters. During the initial two rounds of competition, the AJHS Navy JROTC team earned top scores out of the 115 teams from around the world to win a place in the National Academic Bowl and the all-expense paid trip to D.C. In the two fast-paced preliminary rounds, students were tested on their knowledge of JROTC curriculum, English, Math, and Science. One of the main goals of the JROTC Academic Bowl is to prepare students for state exit/graduation exams as well as college entrance exams, such as the SAT and ACT, said the release. The winner of the Navy JROTC Academic Championship will compete against the winners of the Army, Marine Corps, and Air Force JROTC Academic Bowls in the JROTC Joint Service Academic Bowl Championship. The JROTC Leadership and Academic Bowl is a nationally recognized academic competition created exclusively for JROTC students. The competition creates tremendous opportunities for JROTC cadets by allowing them to demonstrate leadership and academic abilities. College Options Foundation is a non-profit organization dedicated to enriching the academic development of high school students and assisting them in their preparation for higher education. Using academic competitions, college exam study guides, college admissions tutorials, and personalized counseling, College Options Foundation has assisted the nation’s JROTC cadets worldwide for over a decade.